I've been on winter break for just about a week and a half now, and I was so blessed to have a couple friends let me stay at their apartment while one of them went home to North Carolina for winter break. I stayed close to school rather than moving back home because of work so I wouldn't have to commute so far. I've really enjoyed living here so far mainly for one reason: A KITCHEN! Living in the dorms have been fun because of the community and being on campus, but the thing that I've always wished that I've had was a kitchen, and most on-campus dorms only have kitchens for those with special health needs and can't eat what's in our dining hall. Because it'll be my senior year next year, I really want to slowly transition to post grad life, and that includes living in an apartment off campus. One of the main reasons: having a kitchen so I can cook! I didn't grow up eating a ton of American food on a daily basis because my parents always insisted on feeding us Filipino food. I hated it growing up because I hated eating rice with everything but I'm so grateful for it now that I'm older. One of the biggest reasons for wanting my own kitchen is being able to eat Filipino food when I want! I can't do that now because most of my cooking consists of typical American breakfast foods, but as the break goes on (and when I eventually have my own apartment next year) I'm so excited to learn. I love having my own kitchen because I love grocery shopping and the idea of preparing my own food for me to eat. There is also that satisfaction of your food tasting good and knowing that you made it yourself. I've been pinning lots of easy (and cheap) recipes for me to learn so that I can try cooking some new things on a college student budget. I love experimenting with new foods. Send me some pins if you have any ideas for me to try! 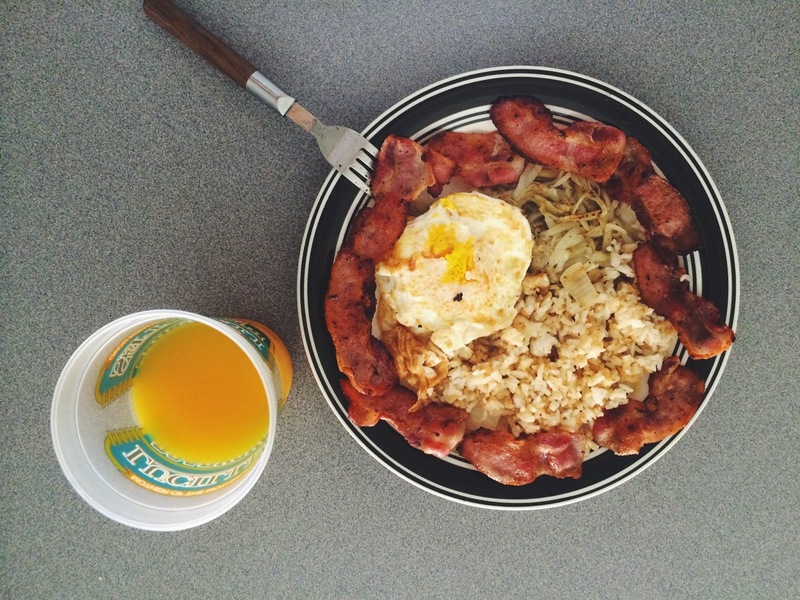 Follow Kriselle Mendoza (Livin' and Lovin' Blog)'s board Let Me Eat on Pinterest. Even though I'm only staying in this apartment until mid-January, I'm going to enjoy it while I can, especially the kitchen. It's making me excited for getting to do this for real next year! Until then, I'll experiment with what I can, and follow me on Pinterest if you want some ideas too! This looks so delicious! Please share a recipe, dying to make this! That looks yummy! For being a beginning food experimenter, I would definitely recommend trying out different ways to make pasta. It's easy, cheap, and honestly pretty hard to mess up. Just last week I sauteed some italian seasoning and whatever veggies I had in some butter to put with my pasta and it turned out delicious! I lived in the dorms my freshman year of college and surprisingly really missed a kitchen.. I never realized how much I appreciated having fresh food! Love your blog! Thanks, it is super simple! It's just shredded potatoes, eggs, bacon, fried rice with sauteed onions and soy sauce drizzled over it, and that's about it! Thanks for the tip! I've been seeing a lot of easy pasta recipes on Pinterest and Buzzfeed so I'm thinking that I definitely will have to set aside time to make some of my own pasta. I'll look into it!